For a penultimate episode, "Missing" set up a lot of potentially fun stuff for the finale. This episode served two purposes: the first was to get the ball rolling for the end of the season, what the final conflict will be. That's the action side of things. 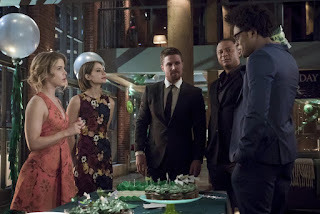 I'm going to break my format a little bit and talk about the island as part of the review, because that's the other part of this episode: remembering the past and Oliver's emotional place. No matter the outcome, this villain can't win. He's a crucible, not an endgame. His entire point is to get Oliver past his demons. Most of the episode was spent with the smirking evil grin guy taunting Oliver with his amazing fifty steps ahead plan, and Oliver trying to play catch-up to save his friends and family. Chase is so overconfident in his ability to read Oliver that I hope it's his downfall. I hate smirking villains. I just want to slap his smirk off his face. I'm saying that because I want to talk about Chase a little bit. Why is the Joker a good villain but Chase is not? They're both psychopaths, they are both reflections of our hero. But in this case, Chase is humorless. He's almost too effective. Oliver can't seem to win against him, while Batman almost always had the upper hand against the Joker. Batman and the Joker revolve around each other like forces of nature. Neither can succeed because they need each other to survive. Chase doesn't fit Oliver. He is not an endgame, as I said before, unlike the Joker. He is simply a test for Oliver. I know his plans are not going to succeed entirely, and that hopefully it will be incredibly satisfying to watch Oliver defeat him. The episode itself went by very fast. I really liked the stuff with Felicity and Diggle. I thought there were some nice character moments with Quentin realizing that Rene hadn't slipped out on his daughter, a nice counter point to the previous episode; I hope they can resolve that so Rene can get his daughter back. I think Dinah's new sonic dampener is going to come into play, but I don't know in what way yet. And all the action sequences were interesting. The return of Malcolm and Slade just made me smile. I can't wait to see them try to work together as a team. And "team" is something that I have to call into question on the bad guys' side. Why are these three women working for this psychopath? Talia, by herself, is a super-villain without any help. Same could be said of Black Siren. Evelyn might just be a villain in training, but she's a formidable threat without being a lackey. What are they getting out of this? It can't be loyalty. If it is, gross. The surprise party with the kids birthday cake was fun. Kind of the calm before the storm. It was good to see both Yao Fei and real Laurel in Oliver's drug induced hallucinations. Nyssa coming back was just the cherry on top of the cake, and it looks like Slade might just be human again. Wouldn't it be cool to have him back as an ally? Although I don't know how Oliver could work with him given their past. Thea: "I love the cake. Where did you get it?" Diggle: "How 'bout the number 'six'? Is that for the number of members of the team?" Felicity: "Actually, I ordered the cake for a six-year-old, because I wasn't sure that I could order a Green Arrow cake for a grown man." Felicity: "Freeze, jerk wad! (Realizing it was Oliver) Sorry. I knew it was you, but what if it wasn't you you. You know, multiple earths, evil twins, et cetera. Et cetera being the scariest thing I've said all day." Felicity: "If Malcolm Meryln has proven anything, when it comes to the League of Assassins, locks are more like suggestions." Merlyn: "I admire you, Oliver. It takes a special kind of idiot to actually get dumber with time." Oliver: "I am not in the mood, Malcolm." Merlyn: "Human connections are what keep us human! And it's sad that it's a sociopath who's gonna have to point this out to you." 3 out of 4 villains returning to the spotlight. Was so great to see all the past villians again and working with Oliver. Didn't I already comment under a review of this episode? I remember writing about Manu Bennett maybe agreeing to come back so that his character can die because he wasn't too happy with Arrow the last time they made him come back for an episode in season 3. Great penultimate episode. Awesome to see Nyssa and Slade Wilson again. I guess Manu Bennett agreed to come back and get killed so that he won't have to ever be bothered with Arrow. Or maybe he decided to not be mad at the show anymore. Malcolm Merlyn infiltrating the bunker again was cool too. I guess he is over wallowing now after his Legion of Doom stint. Good that they did not forget Evelyn and Talia. Team Chase still needs a hacker though to be a full foil for Team Arrow. Maybe Helix will play a role in the finale too?